The Yomawari games are Switch-bound! Right up there with the best horror games of the generation, Yomawari: Night Alone and Yomawari: Midnight Shadows manage to combine very cute art, very Japanese aesthetics, and truly shocking moments to make something unique and memorable. Now, the two games are coming as a single double pack on Nintendo Switch! Unsurprisingly the collection will release in time for Halloween - October 26 in Europe and October 30 in America. There's nothing more than the basic games being promised in the collection - no additional features or bonuses, but that's okay, because both games were more than sufficient in their own right, and being able to enjoy them together on that gorgeous Nintendo Switch screen on the go is bonus enough. The Nintendo Switch continues to be a dumping ground for every existing game that can work on the console, and we love it. Bring on the games. 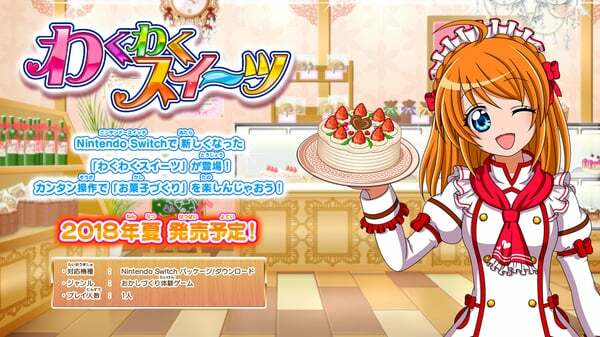 Not since Cooking Mama has a game involving making food looked as sweet as this! Waku Waku Sweets is being released for the Switch this summer in Japan, with Amazon listing the release date as August 9. In the game, you play as a sweet shop owner. You can learn to make a variety of sweets such as cakes and macaroons, and some features will require you use the Switch’s built-in gyroscope by moving the handheld console itself. Of course, a girl’s life can’t be all work, so you can also change clothes, visit town, and interact with the townspeople. There is zero word on any sort of Western release, but I’m going to remain ever hopeful since its available on Western 3DSes. Temtem is a new Pokemon-style monster collecting game that’s looking to Kickstarter to raise the development cost that it needs to finish work, and is looking to release on PC and (hopefully) Nintendo Switch. Though it still needs to be successfully funded on Kickstarter, there’s a lot to like about it already, with some gorgeous art, and an ambitious set of features, including a story that takes place in a massive online world — yes, that’s right, this one’s looking to bring MMO action to monster collecting! You can read more details at the game’s Kickstarter page, where things are off to a good start — it’s about a third funded at time of writing. Unfortunately the Nintendo Switch version requires a massive stretch goal, but fingers crossed, because who wouldn’t want MMO Pokemon? Recently, Capcom released Mega Man Legacy Collection and Legacy Collection 2 on the Switch, but the real news is that the brand new mainline Mega Man title has a release date later this year. It’s Mega Man 11. Mega Man 11 will use the same side-scrolling action gameplay the series is loved for. Dr. Wily is back as the villain. In the above trailer, you can get your first look at the new Double Gear system as well as two bosses, Block Man and Fuse Man. Join Mega Man on his latest adventure on October 2 for PC, PlayStation 4, Switch, and Xbox One. If the Legacy Collections and Mega Man 11 isn’t enough, the Mega Man X Collection will be out this July.